Vidor listed as number three with 9.45 deaths per 100,000 residents. On the same list, Forney—which is part of the Dallas Metroplex—ranked worst overall despite being a small town. BEAUMONT — Several Southeast Texas cities have been listed in new survey ranking Texas cities and towns by their per capita DUI fatality rates. Vidor, with a population estimated by the US Census to be 10,854, is ranked at number three with 9.45 deaths per 100,000 residents, according to a recent analysis from Value Penguin based on TxDOT data. On the same list, Forney—which is part of the Dallas Metroplex—ranked worst overall despite being a small town. Forney is about twice the size of Vidor at 20,336. Other towns across Southeast Texas made the top 50. Lumberton is listed at number 16. Although Orange is in the same county as Vidor, it ranked 51. Port Arthur was 64th deadliest and Beaumont was 93rd at 2.54 deaths per 100,000. Beaumont's current estimated population is 119,114. Port Arthur is 55,498 and Lumberton is 12,829, according to US Census data. For comparison, Dallas was number 4 and Houston was number 8 in the study. More than 17,000 car wrecks involved a drunk driver in 2016 across the state of Texas, according to the study. Baytown had the highest rate of DUI-related deaths of any city in the Houston metro area, and third worst among other large cities, according to the data analysis, as well as earning the title of large city with the biggest increase since 2011. The researchers noted that Baytown is also located along Interstate 10, which Value Penguin ranked as the fifth most dangerous highway in the US in a similar study, with the Harris County stretch being the most dangerous statewide based on EMS wait times and fatalities. 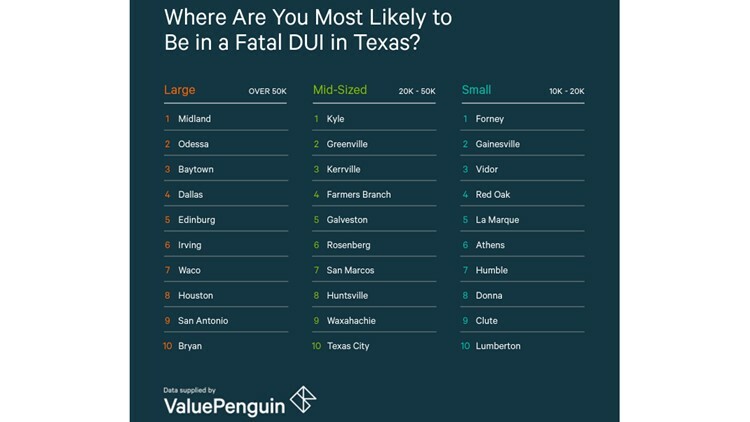 Midland ranked as the number one most dangerous large city for DUI fatalities, although part of Midland is in Martin County, one of Texas’ dry counties. Nearby Odessa was number two. David Ingram contributed to this report.